Sometime earlier this week we introduced you to top 10 wedding sherwani and men’s suit designers in India whose signature we drool on. Since designer groom’s wear don’t come cheap and with all the other big fat Indian wedding expenditure that you need to take care of - cutting back on your wedding outfit seems like an ideal thing to do?! We would however suggest you to not compromise on your wedding look, grooms. It’s your big day too. So, it’s only fair that you look nothing less than a dapper prince, if not a royal king! Our blog is here to help all those bridal couples who are planning a wedding on a budget. 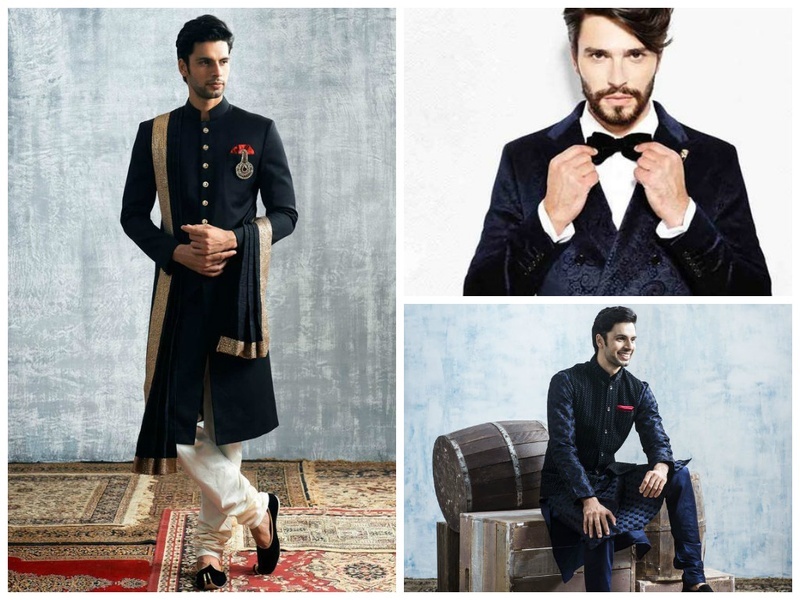 Today, we share with you some of the most popular go-to brand shops in India for wedding suits and sherwanis for men by budget shoppers. These stores stock a huge collection for both grooms and groomsmen in latest styles at a reasonable price. We know you want to save up big for that honeymoon you’ve got planned out. So, go ahead, waste no more time and check out these top shops that are soon to run full-house as the wedding season approaches. Manyavar showcase specifically in the ethnic wear category. But amongst that, their apparel consists of everything from traditional wedding sherwanis and men’s suits in indo-western and contemporary styles. Their designs are sophisticated and a number of grooms choose this to be their one stop shop for wedding outfits. From rich embroidery designs to clean-cut, minimalist looks, they have it all. This is just about one of India’s oldest brands and generations of your family probably have memories with it. So why not get in line to make some of your best ones wearing Raymond. Not to mention, the fabric they use is off the charts and that merino-wool blazer is going to have you looking very dapper at your reception. FabIndia is an ideal store for a minimalist groom that likes no-drama and prefers simple yet a sophisticated ethnic look. This store’s USP is blending traditional craft techniques with contemporary designs and handloom fabric. Whether it is hand-woven textiles, block printing or hand embroidery, all their garments are sure to have a handmade touch to them. Diwan Saheb is another high-profile company that’s been around for a long time and boasts a record of repeat customers – a fine proof of their craftsmanship. What this brand shops in India is about is good fabric with luxurious embellishment and embroidery, which is accompanied by rich colours and textures that offer a regal and lush look. They cater to both styles ethnic wedding sherwanis and western men’s suits with custom tailoring. Here, you’re sure to be spoilt for choice. Blackberrys is a stylish menswear brand that offers western suits, shirts and trousers. All of their designs are detailed, clean-cut, no-nonsense designs of elegance and class. Though they love the use of black and white, they also play around with bursts of colour, giving a much contemporized look to their garments. No doubt, this brand will have you looking sharp on your big day. Infused with Indian craftsmanship and textile heritage, this brand speaks volumes about sophistication. Very modern yet desi, is what you will look like, dressed in their designer wear. So..make the girls drool and show of your desi moves styled by Samyakk. > 7 Wedding Vows from Real Grooms That Will Make You Teary Eyed!